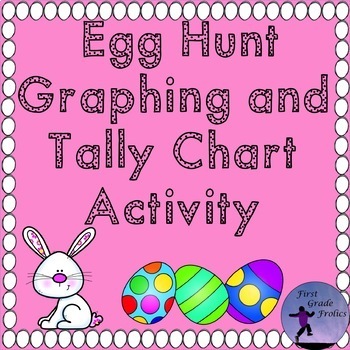 Get your students moving while they practice their sorting, fine motor, graphing, tally, and communication skills with this fun graphing activity. 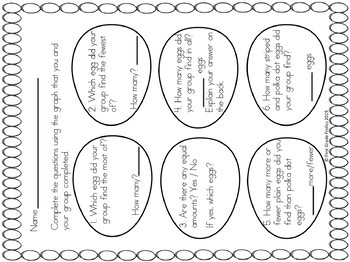 Students will color and cut eggs for the teacher to hide. 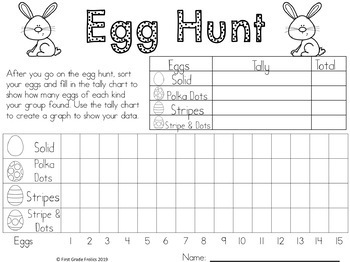 After an exciting egg hunt, small groups will sort the eggs they found and compile their data into the tally chart and graph. The activity will conclude with a students analyzing their data and answering questions about their graphs. *Go to your ‘My Purchases’ page. Beside each purchase you'll see a ‘Provide Feedback’ button. Each time you give feedback, TPT gives you feedback credits that you can accumulate and use towards your future purchases. I value your feedback greatly as it helps me determine which products are most valuable for you and how I can continue to improve my products.